Employee recognition is a hallmark of a successful company. When employees feel valued, their job satisfaction increases. When their job satisfaction increases their productivity grows. A good recognition program can do both successfully, but a great program elicits teamwork, builds morale, aligns the employee with the company’s goals and core values, builds on the company’s brand and reputation, lowers turnover, and serves to attract good candidates. So, while employee recognition is a good thing, recognizing employees for servant-hood… well that’s next level stuff! 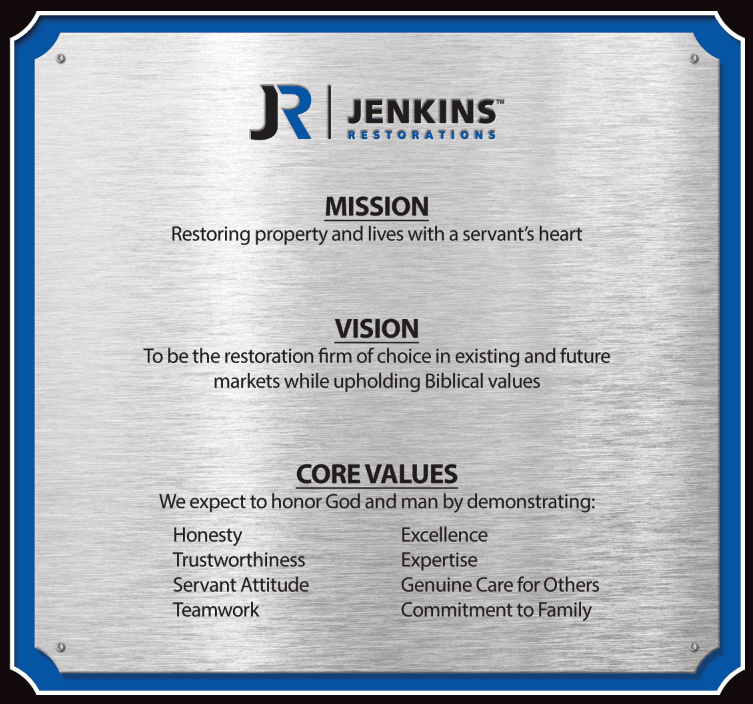 At Jenkins Restorations, our mission is to help others by “Restoring Property and Lives with a Servant’s Heart.” It is not unusual to overhear messages or stories of how this happens within our company. This type of servant behavior is what Jenkins employees are all called to exhibit. Therefore, every year it is our immense pleasure to recognize those among us who live out our Mission Statement in an exemplary fashion. Examples of such displays are not always known by others, since those displaying a “servant’s heart” are not doing so for the sake of public recognition. Yet, when such behavior is noticed, it brightens our hearts to know how others have benefited from interactions with our “Jenkins team”. 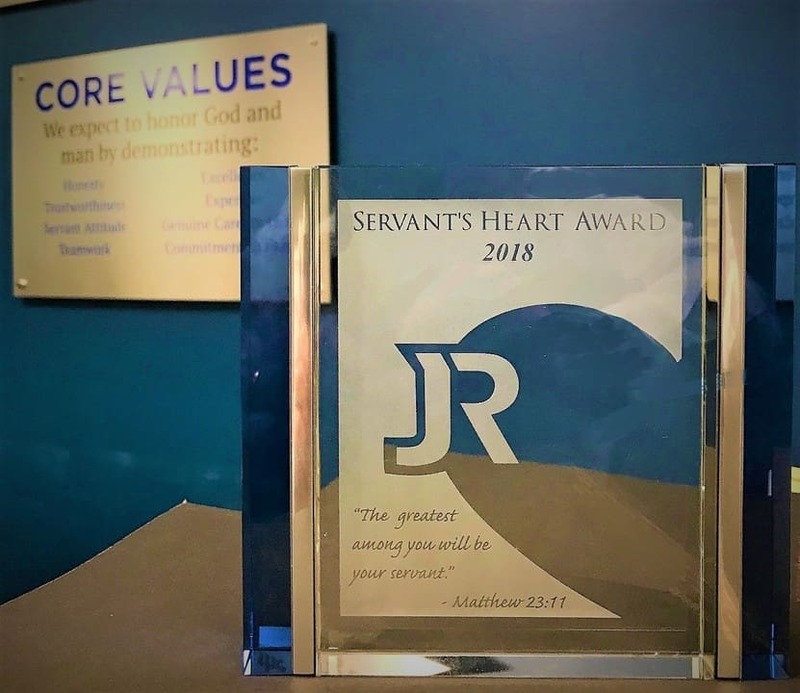 To formally honor those who have been exemplary servants, the Jenkins team has approved annual awards to recognize those who most fittingly demonstrate our mission statement. 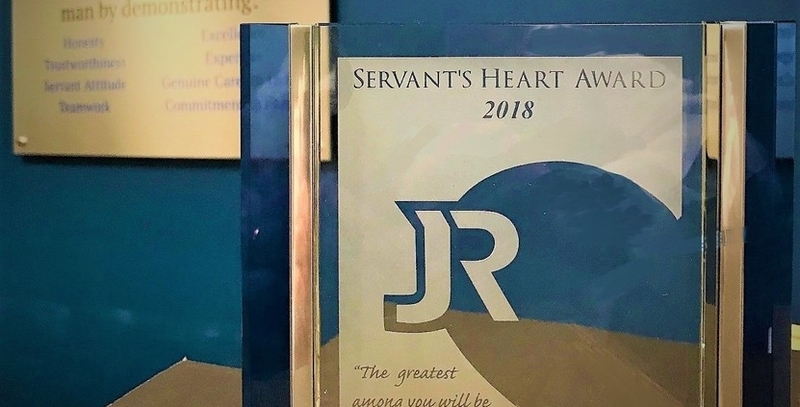 This award is designated as “The Servant’s Heart Award” and is our most highly esteemed company award. Nominated by several people from both in and out of his direct area span of care. John has a big personality coupled with regular humble acts service – everyone knows they can turn to him for help whenever or wherever they need it. John is willing to do whatever is needed. He has helped with needs from small engine repair to roof tarps and board ups and taking care of our customers who are in need. This former executive level professional is eager to serve wherever he is called. People attribute the reason they stay at Jenkins to John and his ability to lift their spirits daily. Nominated by his branch co-workers. 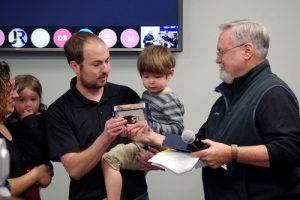 Andrew humbly does his job while going above and beyond for clients – building fans for life. Dealing fairly with an insurance company when another person’s estimate and scope was excessive for what was needed to complete the project. Andrew then reimbursed the insurance company for the difference. Integrity is what one does when no one is watching. That is the definition of Andrew. Nominated by her branch co-workers and others in multiple branch locations. Krystina has consistently gone above and beyond her assigned tasks to evaluate and enhance the role she performs in order that others in the same role may provide a better service to their internal client – our Project Managers. Krystina sacrifices her personal time so that she may assist others in her same role by creating training that includes videos and standard operating procedures destined to live on as a ready reference. 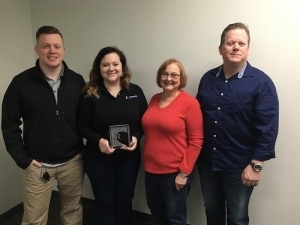 Krystina’s impact is felt across the company, even to our new Florida branch where her servant attitude has been witnessed supporting these project managers beyond their expectations, even though her home office is in Texas. Nominated by her branch co-workers. With her servant’s heart fully on display, Martha regularly comes into the office to empty out trash and tidy up even though this is not one of her responsibilities, just something she takes upon herself to help her co-workers. Martha regularly brings home-cooked food in to the office to share among the staff. It is always homemade food made from the heart to share with hungry Project Managers who many times forego lunch to meet deadlines. Martha can’t stand to see anyone around her go hungry, and she can’t resist creating the smiles that good food brings. Martha brings joy to people through her special ability to always share a smile with those around her. Martha is a very hard worker; always shows up and never complains. A Servant’s Heart Award just wouldn’t be credible without starting with her. She does her job well, being faithful especially in the un-glamorous and unpublished daily grind. The San Antonio branch refers to Martha as our work mom, always watching out and taking care of us. Two thousand years ago Jesus reproved a woman named Martha for being too concerned with waiting tables while her sister had chosen the better path. 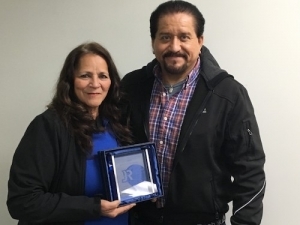 Well, Martha Martinez has taken Jesus’ words to heart and has found a way to do both — she sits daily at the feet of Jesus while laboring in service to others. Since July of 2017, Joe has shown love and compassion for a client that may never rebuild and he may never receive compensation. The elderly couple had a fire in their house that resulted in the husband being sent to a permanent care facility and the wife left to deal with the rebuild. A collector of many treasures, the wife had no family nearby and no one to help her through the process of releasing the contents or even with travel to see her husband at his new home 45 minutes away. Enter Elissa LaRock, Joe’s wife. After hearing the plight of the wife, Elissa took it on herself to sacrifice her weekends and brave the DC traffic to take Mrs. to see Mr. on more than one occasion. The wife was so excited to spend time with her husband. It had been a year since she last saw him. All the while, Joe continued to act as a son to the wife, helping her work through the emotional trauma of having a life suddenly upturned by a fire. Sadly, she recently passed away. 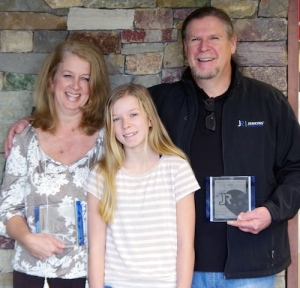 Both Joe and his wife Elissa receive the Servant’s Heart Award for their love and care of this family struck by tragedy. 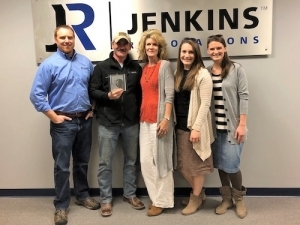 Join us in recognizing these deserving recipients of our highest honor here at Jenkins Restorations, our 2018 Servant’s Heart Award Winners! I have had the pleasure of working with Martha Martinez during my my restoration and she is amazing! Congratulations, well deserved! Jenkins restoration has been the best part of my problem. A pipe under my sink busted and from day one, they have constantly kept me informed of the progress and the process. They have actually been in touch with me more than my insurance company. They are very professional and polite. They have gone above and beyond to help. I will recommend them to everyone. The two young men, Brandon Payne and Dylan Presler, are definitely an asset to the company. I just can’t say enough good things about them. I couldn’t be more pleased. Thank you for your help and making this event more tolerable.